Keith Hebden's Seeking justice is recommended here to non-Christian activists who are wondering why these Christians keep turning up with "their" actions. Secular people will surely express it that way, I once belonged to their tribe. And I do not like the word "Christians", which can be easily fitted into a identity political discourse so as to compete with the Minority of Choice (in the USA this is common practice). To me being "a Christian" however can only refer to what someone is striving for, the horizon you can see but will never reach, just like "anarchy". That is why the two can be combined very well and I know Keith Hebden on that basis (e.g. from this site). In his latest book he does not refer to Christianity, he commends the imitation of Jesus (not: Christ), which fits into the Christian anarchist tradition. Seeking justice can be read both as a practical guide (to Christian anarchism I would like to add, but you have not read this, have you?) and a manifesto. As far as I can judge it is meant especially for persons in a community, or willing to belong to a community, that considers following Jesus (or Jesus Christ) important. That may be a dwindling minority which can be seen both as a loss and as a benefit. I wonder whether so-called secular activists as mentioned by Grumbling Graham are seeing as much of the inside of jails or prisons as Ciaran O'Reilly, Martin Newell or - people I have met at the Nevada Desert Experience as Megan Rice, Steve Kelly, Louis Vitale (who I never have seen actually, since he spends most of the time behind bars). It takes stamina that might be best inspired by belief. Sometimes Keith gives exegeses that are new to me, a contextual explanation of the water-into-wine story for example. which he turns upside down. And a book for turning the world upside down it is. You are cordially invited to give your opinion on the book in the comments, if you have read it. 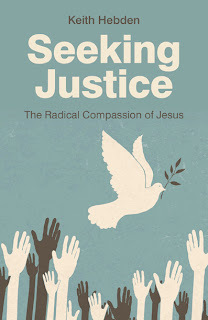 - Keith Hebden, Seeking justice - the radical compassion of Jesus. Winchester: Circle Books, 2013. The price of the paper edition varies from around nine to twelve UK pounds.